Waited to see if some of the turf would survive the hydraulic leak from a couple of weeks ago on #16 green. Finally gave in and repaired it today. Russ pulling out the bad strip and replacing with new sod. At the beginning of my golf maintenance career, the first major project that I was responsible to supervise was a bunker renovation as an assistant at Sunset C.C. With a recommendation from the green committee and support from the Board of Directors, we are at the early stages of a most exciting project here at Glen Echo, the renovation/restoration of our bunkers. A committee consisting of members and staff has been formed and is meeting to determine how to raise funds for this project privately through our most generous membership. Additional details regarding the committees work will be forthcoming after the first of the year. As a part of this effort, our staff along with Kye Goalby from Goalby Golf Design will be embarking on the renovation and restoration of hole #14 to give the membership an example of the work that will be accomplished over the next 12-18 months. There is a green committee meeting this evening in which the project schedule will be discussed and finalized. In general, a majority of the work is to be completed in 2012. We will begin to tear out the bunkers on #14 late in the afternoon on Sunday, October 2nd. The main work should be completed by Thursday, October 6th including sod and sand. The hole will be open for play during this process. Our staff will be involved in all activities of the renovation except for the actual design/shaping of the bunkers in which Mr. Goalby will complete this work. Below is a link to an interview that Kye gave to Golf Club Atlas in 2010. It speaks of his career and how it started, where he as been and what the future holds for him. I think you will find it most interesting. Locally, he has been doing shaping work of the bunkers at St. Louis C.C. He has traveled throughout the world with architect Tom Doak. Plan all aspects of the project with Goalby Golf design including increased staffing during the main project work as well as maintaining the golf course. Provide constant communication to green committee, fundraising committee, Board of Directors and all membership/staff during the process. Ordering all supplies and equipment needed to complete project. Removing existing bunker sand, gravel, drainage pipe, and sod from around bunkers. Finish shaping bunker with Mr. Goalby, edging, trenching drainage, removing soil spoils and installing drainage. Spray on a polyurethane permeable liner called Klingstone which reduces the potential of soil contamination to our new and clean sand. Sodding new bunker area and installing sand. On going watering of sod/sand and mechanically compacting sand to improve playability once the bunkers are complete. Hand raking completed bunkers to protect integrity of the new bunker sod, edges and assist in improving firmness of new sand which has a tendency to be soft during the initial few months of installation. A great look with two new bunkers being placed back into play as originally designed! 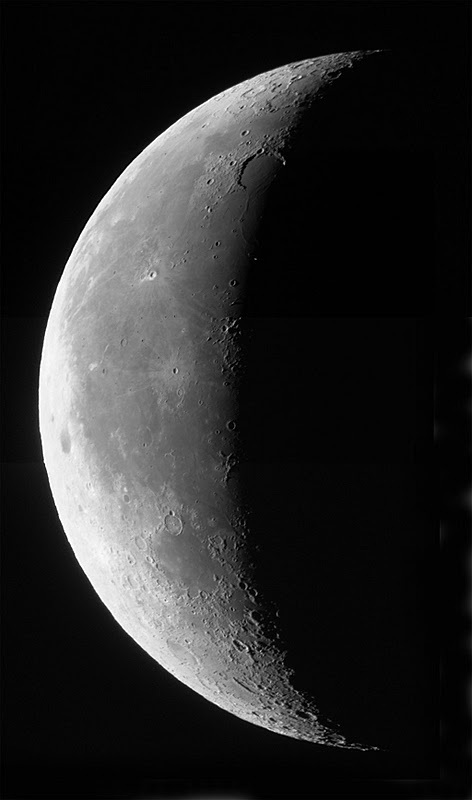 The clear skies and a last quarter moon of last night has brought great anticipation to today's Echofest Member/Member Tournament. A cool morning with a foggy sunrise met our staff as we began today's activities. All areas of the course will be mowed today in preparation for the tournament. Greens have been rolled the last 3 days to assist in bringing additional speed to the slightly soft and moist conditions we have been experiencing over the last couple of weeks. Fall has arrived by the calendar today but the temperatures of fall have been here for a few days now. The staff has been gearing up to provide you with some very good conditions over the next couple of days. We hope you have a great time! Lady relaxing as I prepare to change holes with the fog rising and our beautiful clubhouse in the background. I was contacted a couple of months ago regarding an interview for 'Superintendent Magazine' about our aeration practices here at Glen Echo. Below, is the article that was written from the interview and or the link to the website. It's early August, and the temperature is hovering around 100 degrees Fahrenheit in St. Louis, where Joe Wachter is the golf course superintendent of Glen Echo Country Club. August is starting off where July left off - and it was one of the hottest Julys in the city's history. The greens on the golf course at the Rock Creek Cattle Co. are awakened in the spring with a core aeration. PHOTO: COURTESY OF ROCK CREEK CATTLE CO. The conversation with Wachter turns from the weather to aeration, which has everything to do with the hot weather and more. Ask any superintendent about aeration, and he or she will tell you that each course will have its own distinct program, because each course has its own microclimate. Throw in different soil and grass types, water quality issues, number of rounds, etc., and a course's aeration program gets even more defined. Consider this a refresher course on aeration. We checked in with a few superintendents as well as Bob Carrow, Ph.D., professor of turfgrass management at the University of Georgia, to get their aeration tips. Some will sound familiar, and some might make you think about doing things a little different. The early bird gets ... happy golfers. Wachter core aerates his course's putting greens, which average about 30 percent Poa annua and 70 percent Crenshaw bentgrass, in the spring with .5-inch hollow tines. He prefers to get out in the early spring to get the all-important but intensive task done ahead of time. "The best time to do it is the middle of April," Wachter says. "But I try to do it before the first of April just to get it done and out of the way." That way, the greens are healed up and ready for opening day, Wachter says. And then he doesn't have to carry out another golfer-disruptive task until the following October. "We want to aerate as early as possible so we don't disrupt the players," Wachter says. Wachter's initial core aeration usually lasts until May, when he implements a monthly needle-tine aeration program with a Verti-Drain. Wachter uses .25-inch solid tines and aims to complete the task on the first of each month through September. Also during the summer, Wachter hires a contractor to aerate the greens with a Hydroject. The HydroJect, manufactured by The Toro Company, aerates the greens with "water jets." These jets are pulses of high-velocity water, released at regular intervals. Wachter prefers to bring in the HydroJect sometime in July, "during the middle of the heat," he says. The process is not very disruptive to the greens. Wachter waits until the end of October to perform the final aeration of the season - a solid tining of about 8 to 10 inches. Those holes are filled with sand. For the year, the Glen Echo greens receive about six aerations/ventings. Core aeration is important for many reasons. It's also the best time you can put down the most sand and work it in to dilute organic matter, says Bob Carrow. "If the weather doesn't cooperate, we might end up missing a needle tine," Wachter says. "But usually we get at least three needle tines, one HydroJect and two deep-tine or core aerations." Wachter, who has been a superintendent since 1993, has changed his program over the years, keeping up to date with new technology, such as needle tining. He likes that needle tines can punch holes about 1.5 inches apart. That way, the greens can be dried in the root zone if they are too wet, or they can be watered in the root zone when they're too dry. 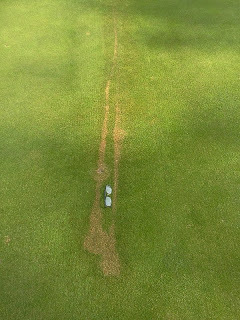 Wachter realizes that many of his peers prefer to core aerate greens in the fall, but he prefers not to because the created holes encourage Poa annua growth, and fall is ideal for Poa annua germination in the St. Louis area. "I also don't like to disrupt the greens," Wachter says. "It's still too hot to aerate, and I don't like to tear them up. Besides, they're usually trying to recover from some type of damage anyway." Wachter prefers deep tining the greens in the fall. "I just want to get a deep base so they will drain in the winter and grow strong roots late into the fall," he says. Wachter realizes he wouldn't have a job if it weren't for golfers. So he's all about pleasing them, which means working around them as far as aeration scheduling. "I've tried to move it to times that are the least disruptive for golfers," he says. "We're here to make golfers happy ... and keep them happy." On occasion, a certain green might require an extra needle tine or solid tine aeration. That would be Glen Echo's 11th green, which is flat and doesn't drain well. Isaac Farabaugh, superintendent of the golf course at Rock Creek Cattle Co. in Deer Lodge, Mont., faces a challenging aeration schedule because the golf season is so short, about three and a half months, in his area of the country. "Sometimes the ground freezes early, and we end up not getting it all done in the fall," Farabaugh says. Rock Creek features a links-style, Tom Doak design. Being a newer course with only 3,000 rounds a year, Farabaugh has very few thatch and compaction problems on the greens. He core aerates the greens once in the spring and again in late August, and supplements with a PlanetAir machine every two weeks. The PlanetAir shatters soil with a kick-back action that reduces soil compaction. "We also solid tine once in the spring, once in the midseason and once in the fall if we can get it done before the ground freezes on the tees and fairways," Farabaugh says. It's a program different from most because of the short season. Still, aeration is vital. Farabaugh's initial core aeration plays a key role in "waking up" the greens in the spring when soil temperatures are still cold in order to get the golf season rolling. He also uses twice the normal amount of nitrogen in the spring to get the turf going out of dormancy. The University of Georgia's Carrow is a proponent of core aeration, but not just to create large holes. It's all about the topdressing, Carrow says. "It's not just the cultivation process that's so important," he adds. "It's also because that's the time you can put down the most sand and work it in to dilute organic matter. It's just a better way of controlling organic matter accumulation." A core aeration's effectiveness will typically last four to six weeks, in terms of sufficient water and oxygen infiltration, Carrow says. Then it's time to implement a venting program, such as tining. Slitting, another form of aeration, is also less disruptive, even more so than deep tining. But slits don't stay open for long, Carrow says. "You're better off to do a .25-inch solid tine," he adds. In the South, where the winter is short, Carrow says superintendents should solid tine greens as soon as the weather allows it, like in mid- to late March. This will relieve oxygen stress and poor infiltration, and promote maximum root growth later. "The best time to core aerate greens on warm-season grass is when it's warm enough to achieve rapid recovery," Carrow says. That would be May or even into June. Superintendents who oversee courses that receive heavy winter play can't core aerate during those months because recovery doesn't came fast enough in the cooler weather. Carrow suggests two or three tines to keep the greens open just enough to where they aren't disruptive. Aylward can be reached at 330-723-2136 laylward@mooserivermedia.com. Becky is beginning to do some of our fall planting in our high traffic areas around the clubhouse and pro shop. Plants will include Pansies, a few mums, ornamental grasses, kale and a few other surprises. She also has some plans for the four large urns in front of the main entrances for the fall and winter season. Becky has contributed greatly to our staff this season. Beds were well maintained and she was able to make some very good plantings out of the plants I stuck her with that were ordered and grown in the greenhouse this spring. She had to work very hard in catching up on some of the more professional horticulturist work that we were not able to accomplish over the last couple of year. She is beginning to develop some ideas for next season's plantings and greenhouse crop. At the time she was hired, the job was only budgeted for 9 months so we hope that we can retain her for next season. I hope the position can be returned to full time next season but that will be evaluated in the budget process this winter. Becky in the foreground with her back turned to me. She's a little camera shy. Mums, pansies in the flagpole bed near the pro shop. The fog and heavy dew this morning showed the great progress we are making with our first cut of rough and reducing the impacts of bermuda on the rough. The bermuda has a great deal of leaf surface and the dew shows up and is more concentrated on it in comparison to zoysia or fescue. As shown along #16 a month ago, there is still some bermuda in the left half of the picture but it is has been tremendously reduced. To the right of the flag pole is a solid patch of bermuda that was all the way across the picture to the fairway a couple of years ago. As we improve our rough, we will begin to over seed with additional fescue out into the area to the right side of the picture. Mostly fescue on the left with a solid patch of bermuda on the right side of the picture. A wet Sunday, course received 1.25" of rain. Pumped bunkers early this morning. Too wet for much other work. 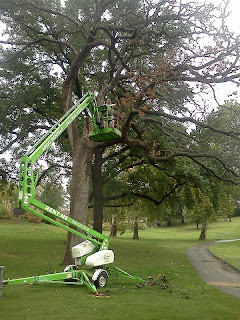 Removing old dead white oak in club lawn near #9 green/lake. Skip in the lift trimming on the large white oak dead near 9 lake. Chipper brought out in field to save time. What is that clear liquid falling from the sky? Well, we received a much needed long and steady rain today to the chagrin of our Ladies Senior Club Championship participants who were forced to stop after only 9 holes. We had received over 1.5" when I left the office this afternoon which was more than double the rainfall we had previously received since July 12th. The course will react very positively with this flushing and deep soaking rain. Some of the salts and bicarbonates that build up in the soil due to heavy city water usage over the last two months will be flushed through the root zone and the water should pull some additional oxygen back in as well. BASF has a turf talk blog and the Glen Echo Country Club Golf Course Maintenance blog is being recognized during the month of September as their "Blogs We Like". I ran across this video from Tim Anderson CGCS, MG from Naperville Country Club. It shows his staff preparing the 18th hole for their Invitational earlier this season. I thought you would enjoy the view and the music is not bad either. (I just read that Assistant Steven Biehl manages the blog at the club). Great job! We have a Little Leafed Linden behind the 16th green near the main road(Marvin Pearson Way). 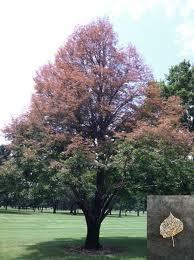 Each season, this tree was attacked by adult Japanese beetles who loved to skeletize its leaves. This season, the tree was treated with a systemic control product(Imidacloprid) to reduce the amount of damage since it is in a high visibility area. As you can see below, the control worked well this season with some slight damage at the very top. Slight damage at the top of the tree where the beetles first were attracted to the tree but once they began ingesting the chemical that was trans-located into the leaves, they moved to a non-treated tree. I thought I had a picture of our tree and its damage from the past couple of year but could not locate it. Here is a good example from the Iowa State blog. We did a light verticutting/grooming of our greens today. This practice forces the grass to stand up and will cut some of the longer blades leading to a better cut. With our higher height of cut over the stress of the summer, the grass has a tendency to lay over and become lazy. The more grass surface area, the more friction created which slows ball roll. Verticutting/grooming, topdressing, and brushing help improve the smoothness and ball roll as we move from summer conditions into some beautiful fall weather. Overnight, the heavier concentrated spray from the hydraulic leak on #16 green died. This was from direct heat of the hydraulic oil where there was concentrated line. We will continue to monitor the remaining section. Hopefully, the oil did not get down into the crown area of the plant. The hydro-carbons in the oil are deadly to turfgrass which suffocates the plant and it dies. The reddish color is due to direct heat burn of the turf. More than likely, this area will not regenerate and will need to be replaced. The overall oil leak was about 1' wide. The concentrated line on the left is where I came on the green and then stopped. The line on the right is where I backed off of the green. 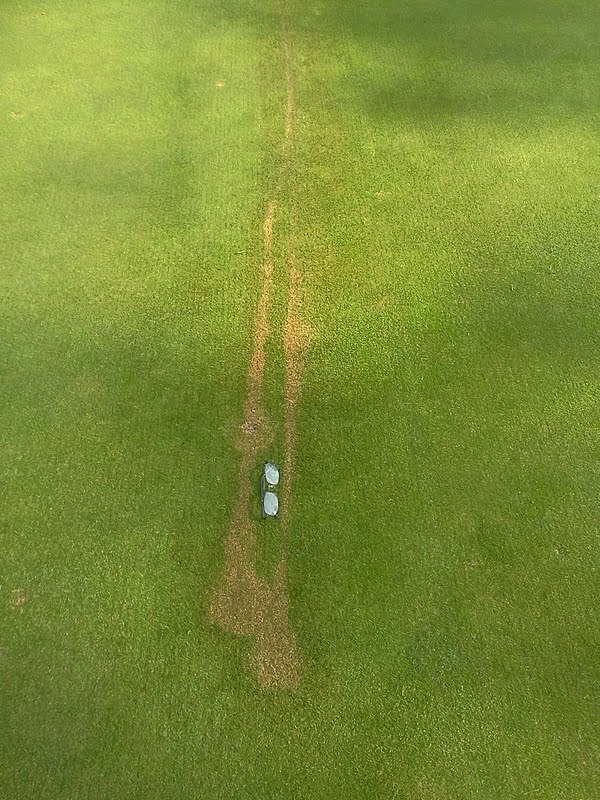 If the oil was not concentrated, there might be a chance that some of the turf will be okay. I was mowing greens this morning in preparation for our outing that was going off at 11:00 a.m. when we experienced a hydraulic leak on #16 green. The leak occurred on the top tier about 15' long and possibly a foot wide the way it sprayed onto the turf. We scrubbed the area with soap but more than likely will be losing some turf. We will be monitoring it over the next few days and will replace the area as necessary. As we reflect on the 10th anniversary of this terrible event, I want to share a couple of thoughts regarding my experiences during that time. I was superintendent at Eagle Springs Golf Course and walked into the pro shop right around 8 a.m. There was a large screen TV with a picture of the first tower on fire. I stood there stunned for a couple of minutes watching NBC's coverage when I saw this dark flying object plow into the second tower. Initially, I thought I was watching a replay of the first flight but I found out pretty quickly that it was the second plane. The rest of the morning became a blur as the attacks continued. Eagle Springs is not quite as busy as Glen Echo with regular takeoffs and landings but we normally went through a sequence for about 4 hours everyday when airplanes would be lining up for landings as they went east to west and then circled around St. Charles and landed from the west. We would also have planes crossing the course flying from north to south landing on the crossing runway from time to time. Over the next week, the daily occurrence of planes flying overhead gave way to the beautiful silence that can be experienced on a golf course but the silence was deafening and very eerie after what our country had just experienced on 9/11. Once planes began to fly, even though we were not back to normal, the noise of those jet engines did bring some sense of normalcy back to my life. Bellerive CC. that week. I had volunteered for the afternoon shift to help the staff prepare for their tournament. I had worked Sunday and Monday raking bunkers. After the attacks, I reported to work that afternoon knowing that the tournament was going to be cancelled but showed up to get the final word. I will always remember the faces of the staff who were so sad from the occurrences earlier that morning. Superintendent Tony Mancuso CGCS attempted to give us the news but was too overcome with emotion to speak. His first assistant Rob Kick(current Superintendent at Algonquin) gave us the news that the event was cancelled. All of us connected to golf understand the work that leads up to a major event. 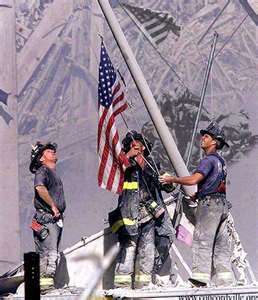 Good guys who in the end were only concerned about what had happened to our country. I've mentioned in the past that I have a membership in a golf course information company(TURFNET) in which I frequent the web board to share information with fellow superintendent's and ask questions. Through that board, I read the firsthand experiences of superintendents who watched the destruction of the twin towers from their beautiful properties around New York City. Also, a number of clubs experienced multiple members/friends who died that day. As I make my way around the property the next few days, my thoughts will be with those we lost and those left behind. I will sit and listen to the quite serenity that a golf course can bring but I will be very happy to have the silence broken seeing those planes flying overhead again. Today will be the first day that our greens will be back to their normal cutting height except for #3 which still needs some time for recovery. Our greens continue to improve on a daily basis. The needle tining that was just completed will improve root growth and encourage additional recovery. We are doing additional plugging into some of the weak spots and will be hand topdressing in some of the areas to help smooth the surface. Grooming/verticutting, brushing and regular topdressing will be occurring over the next week or two to improve our cut and smooth the putting surfaces for the rest of the fall golf season. We are needle tining/venting our greens today(Tuesday) which will assist them in a number of different ways. The small openings will improve water penetration. The late summer and fall are usually low humidity times of the year so the ability to get water down into the root system are important. The channels being opened up also allow for oxygen exchange which will help the greens recover from their summer stress. Roots will begin to form in the channels which will also begin to allow for recovery and preparation for the upcoming winter season. The best root growth of the year occurs during the spring season so anything we can do to improve the overall health going into winter is important. Holes are spaced at 1.5" apart which provide for many openings on each green. Most holes will be closed before the weekend arrives and will provide for little ball roll disruption. Vertidrain aerator with needle tines venting greens. Needle tines spaced about 1.5" apart in a double row. We contracted the removal of the oak tree from the front gate that was struck by lightning earlier in the season. I had hoped to remove it this winter but it has browned out and succumbed to its injuries from this summer. The top is being removed today and the rest of the log will be removed this week. As mentioned in a recent posting, we will have the two trees removed in late fall to the right of #1 tee by contractors who will be doing work over the winter in the ditch near the driving range and hole #1. The large oak near #9/club lawn will be removed by our staff as will the oak on the right of #12. There appear to be other trees that are browning out and showing serious distress as well which we will be monitoring this fall. Power lines, gate, wall and ornamental plantings were too close for our staff to attempt this job plus it is a very large tree. 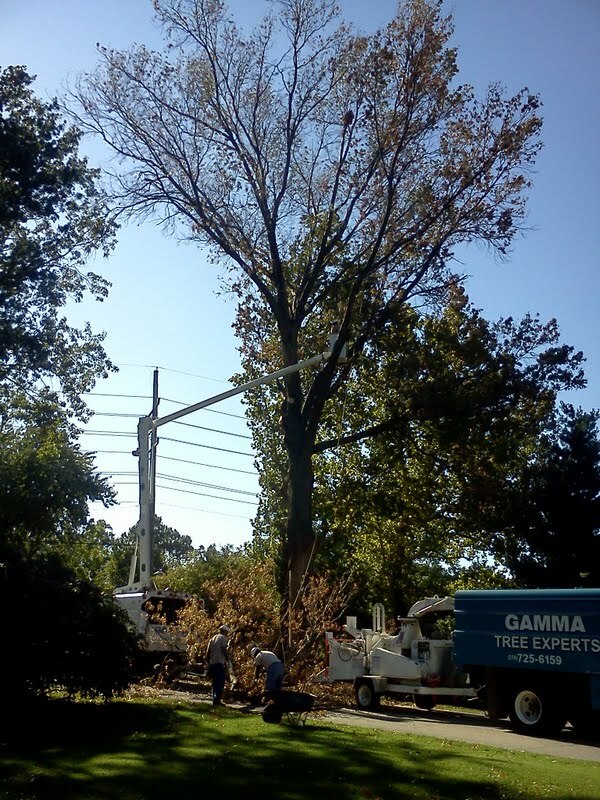 Contracted out the job to a tree service to remove the severely damaged pin oak from the front gate area. We've made it to Labor Day and The Club Championship Finals. We are trying to do as many jobs as we can before play catches up with us. Good luck to the competitors and enjoy your holiday.